A combined retail value of $164 if sold separately. More Details To use Amplifeye Lash & Brow Fortifier, cleanse and rinse the eye area thoroughly prior to every application. Apply every night before bed. For rapid results, product may be applied morning and night. For lash application, apply gel across the upper and lower lash line, as if applying eyeliner. For brow application, using the applicator brush, apply along the brow line using short strokes, massaging into the root area for optimum performance. Allow application area to dry completely. Secure cap tightly after each use. 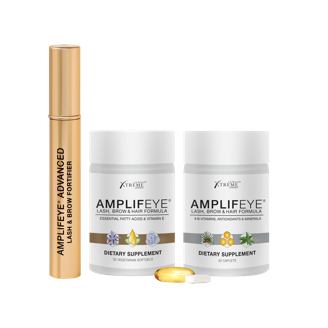 To use Amplifeye Lash & Brow Supplement, take one packette (2 pills) daily with a substantial meal. Product can be taken along with your existing multivitamins. These statements have not been evaluated by the Food and Drug Administration. Learn more.